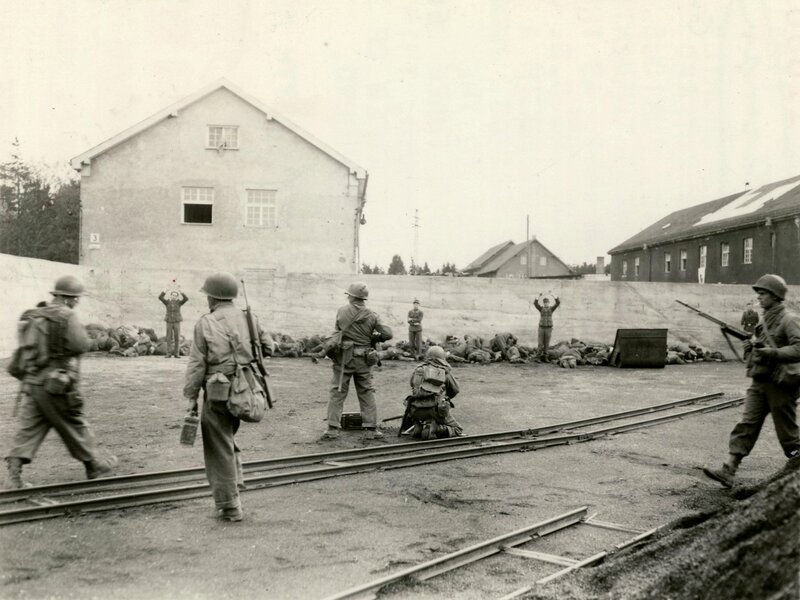 On this date in 1945, American troops liberated the Dachau concentration camp in Upper Bavaria — and then proceeded to summarily execute a number of its SS personnel. 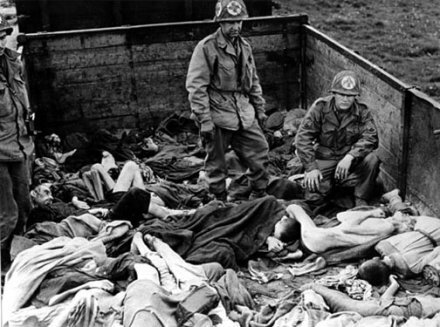 The “Dachau massacre” involves several distinct incidents of wantonly killing defenseless POWs by American troops, who may have been set on edge by warnings of potential fake-surrender gambits, and then evidently went right off the rails with discovery of emaciated dead bodies around the place. In particular, a stranded transport that had been sent from Buchenwald, christened the “death train”, greeted the liberators with a 40-car phantasmagoria of horror. 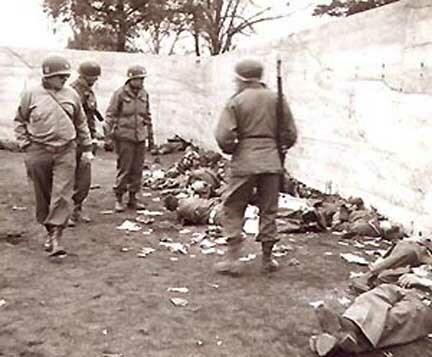 These stunned, outraged soldiers, some of them still teenagers, would soon have a bunch of disarmed German troops from the camp under their power. Uh-oh. The behaviors these facts propose to extenuate may also produce a strong mental reaction. “‘After what we saw, we shot any German guards we saw on sight,” one of the Dachau liberators admitted in the 1990s. 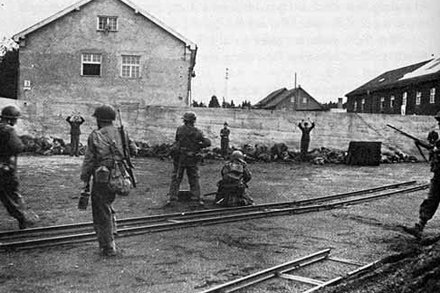 A Lt. William Walsh took the surrender of four SS men near one of these train cars, then forced his prisoners inside the car and shot them on the spot. About seven Germans taken prisoner at the camp’s Tower B were lined up a few steps away from the tower preparatory to marching them elsewhere, when for sketchy reasons one of their American guards started shooting, and then others followed suit. And the most notorious of the incidents, about 50 captured SS men were segregated from other POWs — again, by Lt. Walsh — and lined up in the camp coalyard by the wall of the hospital. There they were machine-gunned, resulting in 17 deaths before a superior officer interceded. Another 25 to 50 guards were killed by prisoners themselves, many with the implicit blessing of American infantrymen who stood by and watched, and or the explicit blessing of Americans’ weapons on loan from sympathetic troopers. The irony in all this was that most of the camp’s regular guards had already fled the place. 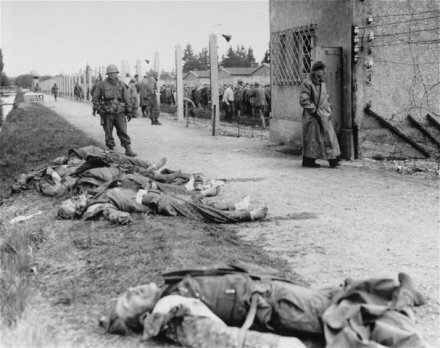 The SS men whom outraged Americans were shooting down in the Dachau charnel house were Waffen-SS who had been transferred from the eastern front just days before and whose specific purpose in the camp was to surrender it to the western Allies. They probably considered this assignment far away from the vengeful Red Army a very lucky break. It wasn’t so lucky: this is the mischance of war. But they didn’t have anything to do with Dachau’s horrors, and their deaths in a unthinking bloodlust disgraced only their executioners. * Court-martial charges were filed, but quashed. The whole affair remained unknown to the public until the 1980s. My step-father was one of the Army JAG officers that was at Dachau. When I was a kid, I found numerous pictures. I eventually took them to the Holocaust Museum in D.C. and they kept one. Pictures of SS guards lined up along a canal that had been shot. Ironically, the commander of the group that liberated Dachau ( a retired General), was giving a talk about this incident the time I turned over the pictures. While they were establishing a government in numerous cities in Germany, he met and eventually married my mother, of which both of us were born in Hungary. My mother & I were at the bombing of Dresden. (Where hundreds of thousands of refugees were fleeing the Soviets) She also told me while she was looking for food and milk, the refugee train we were on were strafed by P51 Mustangs with US insignia. All 300 SS scum should have been hung. Or just turned over to the prisoners to be tortured to death. William P. Walsh was a hero.